This article is about those who claim that Europe is, or should be, a single nation. For the history and ideology of nationalism in Europe, see Nationalism. For the practice of viewing the world from a European perspective, see Eurocentrism. For those who state that the European Union should be a federation or confederation, see Category:Eurofederalism. Pan-European nationalism refers to the ideology that Europe should be united politically due to its being united by a single European culture which began with the production of Venus figurines. Within the larger current of Pan-European identity, there are those who explicitly support the idea that Europe is a single nation, or that it should seek to become one. To be distinguished is the Neo-Eurasianism of the National Bolsheviks, who call for the creation of a single Eurasian nation under the leadership of Russia. 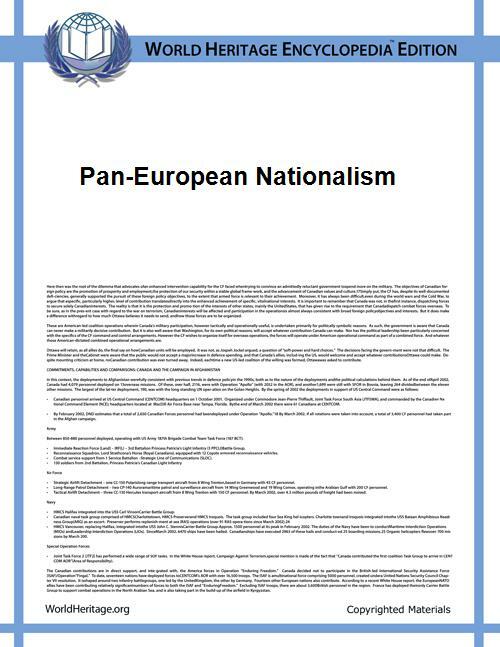 The International Paneuropean Union or 'Paneuropean Movement' was founded in 1923 by Richard Nikolaus Graf Coudenhove-Kalergi. It survived the Second World War, and had some influence on the formation of the European Economic Community. (Coudenhove-Kalergi first proposed An die Freude as European anthem). In New Right. In both countries the idea is also advocated by the Parti Communautaire National-Européen, a National Bolshevik group that succeeded Jean Thiriart's earlier Parti Communautaire Européen.